Wisconsin Hunter’s First Archery Buck—200” Adams Co. Giant! Just down the trail, a big doe popped out in the open. My adrenaline now had me shaking bad. I had every intention of taking a shot at her but in the corner of my eye I noticed more movement behind her, further up the hill. I suddenly stopped shaking as I saw the bigger bodied deer coming towards the water. It walked slower and with more authority than any of the other deer I had seen that night. As it got closer I could see glimpses of antlers through the saplings. About fifteen yards out he finally cleared the saplings, and I could see tall beams. My body remained calm. I knew this was my chance. I got my late father-in-law’s bow in hand, drew back, lined up the sights on the deer, and as soon as he stepped towards the water, I let the arrow fly! I could see the arrow heading towards him and making impact. Oh my! What just happened? After about a hundred yards of zig-zagging through the briars, we saw a massive deer lying right in front of us…. Everyone was speechless….We drug him out of the briars to a clearing to get a better look at his mass and count up the 21 points. We loaded the deer up to take to show the landowners. Everyone was smiling, beers were consumed, and I was still in shock of what had just happened. Well, here’s what happened. Matt killed his first-ever buck with a bow, and the giant scored 200 2/8 green. To make it even more special, Matt shot the dream buck with his late father-in-law’s bow. Click here to read the entire story. BTW, I predicted that 2016 could be the best rack year we’ve seen since 2010 across America. The Wisconsin September bow season is often a harbinger of things to come. I believe we are off and running to a major big-buck year! Good luck to everybody as you start to hunt. 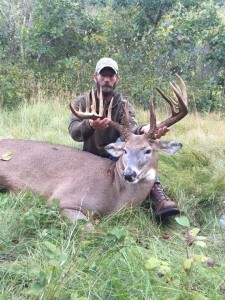 This entry was posted in Big Bucks, BigDeer, Bowhunting, Hanback by admin. Bookmark the permalink. Big beautiful Buck! Character galore! Congrats to Matt. Whoops meant to say first ever bow buck! Wow that awesome! Pretty cool to shoot that with your late father in laws now. 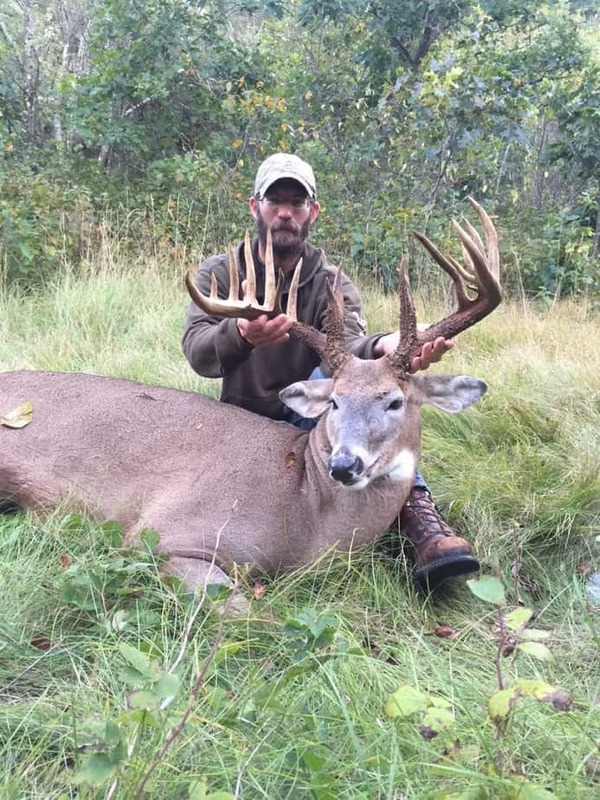 Huge buck, congrats.